"All my life I have loved the look of watercolor but not until my children were grown and our nest was empty did I attempt to begin a journey in watercolor. I'm so glad I took that path for it has been a wonderful time of discovery for me. My journey began with how-to books - reading everything I could get my hands on that dealt with watercolor. It was a great beginning, slowly putting into practice what I was learning. It was a process and I was dedicated to pursuing it. 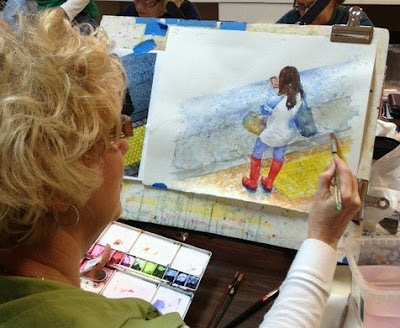 My real turning point came when I enrolled in a watercolor workshop with a well-known and talented local artist. Being a visual learner, I found it very helpful to see first hand how an experienced watercolorist worked. The workshop did the trick. I was able to see what someone else could do and gleaned from that experience what worked for me. Today, I continue to enjoy the learning process. I'm amazed at the many new discoveries happening with each new painting. We gravitate to the things we love and it's obvious by the look of my website that I'm fascinated with painting people and their many facial expressions. I'm constantly looking for a "face" to paint. I believe it's because with each expression there is an untold story behind it. As I continue my journey with this wonderful medium of watercolor I hope to capture many more expressions and the many stories behind them." Deborah Carman is a watercolor artist residing in Mount Juliet, Tennessee. She enjoys painting in her home studio and uses her eleven grandchildren as models in many of her paintings. Her hobbies include singing, playing piano, ukulele, and mountain dulcimer. She also designs and creates furniture for her online Barbie furniture store.